Jimmy was delighted with things and he wasn't the only person in town to be thrilled with a new job. A 40-year-old woman from Burnley had just qualified after a two year apprenticeship, including gruelling exams, to qualify as a funeral director. She'd worked for some years at the Burnley Express before opting for a career change and becoming a receptionist with a local funeral directors. There she became the first woman in Burnley to qualify and to be able to carry the letters NAFD Dip. after her name. She said: "Some people think it's weird, but it's something I've always wanted to do and I've finally reached my goal." Meanwhile a 55-year-old man completely lost it when he tried to kill a local businessman. Mr Anderton, a partner in A&E Engineering in Old Hall Street, was on his way into work when he was beckoned by a resident who pushed a knife against him. Fortunately it didn't break the skin as he told Mr Anderton: "I am going to kill you." He hurried into work but the man followed him and then started chasing an employee around the place, apparently because he'd parked outside his house. Eventually the police were called but the man, back home and now with a big spade in his hands, bellowed at them: "If you break in, I'll crown you with it." It was all, it turned out, due to his wife leaving him and him turning to drink. The court deferred judgement and asked for social inquiry reports. There were special awards for retiring council workers who had given 332 years of service. "They must be old, to have worked so long," I thought before realising that was for 11 employees with those years of service combined. Checks were made that none of them were in poll tax arrears before the awards were made. I'm not sure where the council were getting the money from. At the same time they were pleading poverty because they were facing a shortfall of £100,000 during 1991 in car parking fees. That's what happens when you put the prices up. A group of local folk were sitting outside a pub in Cog Lane having a drink when a man appeared from a back street across the road. He was wearing a balaclava but little else, in fact nothing else. There was laughter from outside the pub before he made his getaway from whence he came. Police were said to be looking for a white male, slim and with no other distinguishing features. 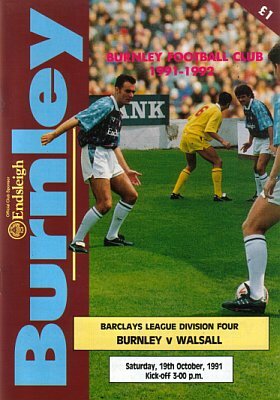 I don't know what the police costs would have been for that particular investigation but figures were released that the costs to Burnley Football Club for the policing of games throughout the 1990/91 season were £40,945 although the club did receive a grant towards that of £20,473 from the Football Trust. Burnley's were the third highest in the Fourth Division behind Peterborough United and Walsall. Burnley received a further grant of £57,559 to provide a police control room and a turnstile counting system at Turf Moor. I presume by 'turnstile counting system' it is meant a system that counts the numbers going in rather than the number of turnstiles at the ground. The town also had some special visitors in this week in 1991, none more so that Malik Ahmad Saeed Anwan, Pakistan's former Minister of Information, Broadcasting and Finance. He was, at the time, the Secretary General of Pakistan's Peoples Party. He met with the Mayor, Councillor Mrs Irene Cooney, and presented her with a traditional Pakistani decorated kettle and received a set of cuff links in return. The other visitors were from another part of the world, that of Kingston, Ontario, Canada. Three young boys were visiting Burnley. For Gareth and Anthony Green it was a return to their birthplace before emigrating as young children. They were visiting relatives and had brought friend Ryan Beleza and all three were treated to a behind the scenes look at Turf Moor where their guide was Jim Thompson, the turnstile supervisor. He introduced them to Mike Conroy and David Hamilton who were both in for treatment. Finally, as Burnley prepared for the visit of Walsall, the Burnley & District Philatelic Society were staging their tenth anniversary. President Eric Hebdon said enthusiasts were descending on St. Theodore's School, the venue for the event, from all over the country. You can't lick that. But all eyes were on new man Jimmy Mullen at Turf Moor. He had John Francis back in the reckoning after completing a three match suspension, but Francis had to settle for one of the two substitute positions as Mullen named the same starting eleven that had hit six at Wrexham. Youngster Graham Lancashire had done as much as anyone to land Mullen the job with his hat trick at Wrexham and he scored again in this 2-0 win. Jimmy had found himself a goalscorer. Graham Lancashire was the talk of the county. He celebrated his 19th birthday with another goal against Walsall. Call it beginners luck but Lancy had the knack of being in the right place at the wrong time for defences. Before Lancashire's goal there had been plenty of play from Walsall and then some drama as we went in front after they'd been reduced to ten men. Walsall had started brightly without really threatening Andy Marriott's goal but Burnley were starting to come into it when Lancashire had a shot stopped by goalkeeper Ron Sinclair only for Steve Harper to latch onto the rebound. Hid goalward shot beat Sinclair but the winger saw his effort saved on the line by the hand of Charlie Ntamark. Sheffield referee Brian Coddington had no choice and didn't hesitate to show Ntamark the red card along with pointing to the penalty spot. Steve DAVIS stepped up and made no mistake to give Burnley the lead. That was the start Mullen and Burnley wanted and three minutes later the lead was doubled. Harper's cross was headed down by Roger Eli to the impressive John Deary whose volley from the edge of the box was blocked by the 'keeper. LANCASHIRE didn't need a second invitation; he was in there first to hit the ball into the net from close range. We dominated the rest of the first half but, at times in the second half, had some defending to do. Even so, Walsall never really looked as though they might breach our back four excellently marshalled by captain John Pender and it was Burnley who came closest to scoring again through Joe Jakub, Andy Farrell and substitute Francis before Lancashire nearly added his second only to be denied by Sinclair and former Claret Colin Anderson. It was a 2-0 win in the end from an all round good performance against a side that, in fairness, were a step up from Carlisle and Wrexham who we'd beaten in the previous two games. It moved us up another place in the table to seventh and all of a sudden things were starting to looking a lot brighter for Mullen's Clarets. Mullen heaped praise on his new goalscorer after the game. He said in an interview: "Through injury and suspension he had to be brought into the squad and since he's come in he's responded in the best possible way, scoring six goals in four games. "He's a cocky little bxxxxxx so and so. He just enjoys putting the ball in the back of the net and that's an asset you can't give anyone." When asked which of the six was his favourite goal, Lancashire didn't hesitate. "Definitely my third at Wrexham," he said and on confirming that he was aiming for the top corner he added: "Yes, I had a quick look, took a swing and it went in." Burnley now had a break from league action. Lincoln City were our next league opponents the week after at Sincil Bank, but before that Mullen was taking his team to his old Bloomfield Road ground for an Autoglass Trophy game against Blackpool. Burnley: Andy Marriott, Paul France, Ian Bray (John Francis 75), Steve Davis, John Pender, Andy Farrell, Steve Harper, John Deary, Graham Lancashire, Joe Jakub, Roger Eli. Sub not used: Mark Monington. Walsall: Ron Sinclair, Wayne Williams, Derek Statham (Mike Cecere 80), Colin Methven, Colin Anderson, Stephen O'Hara, Alan Walsh, Charlie Ntamark, Paul McLoughlin, Chris Marsh, Rod McDonald. Sub not used: Tony Grealish. Blackpool slipped up with a 3-0 defeat at Barnet and that cost them the leadership. They dropped to third place with Barnet now second and Mansfield Town the new leaders after they too had recorded a 3-0 win against Cardiff City. Over four years later, Jimmy Mullen would sign Ian Helliwell from Stockport County, his last ever Burnley signing. 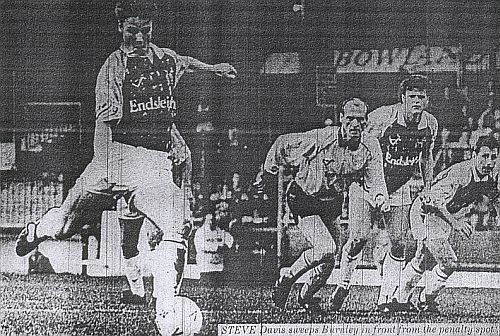 On this day that same player kept Scunthorpe United just a point behind Burnley in the table with the only goal in their win at Northampton Town. As it stood; Mansfield Town, Barnet and Blackpool were in the automatic promotion positions with Hereford United, Rochdale, Walsall and Burnley in the play off positions. Down at the bottom, Doncaster Rovers were at the bottom with Farnborough Town leading the GM Vauxhall Conference.